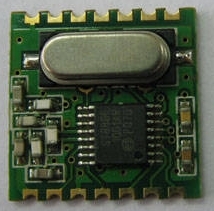 An RFM12B transceiver module. Manufactured by HopeRF. Operating frequency is 868MHz. Full part number is RFM12B-868S1P. As supplied with the HAHnode and roomNode kits.